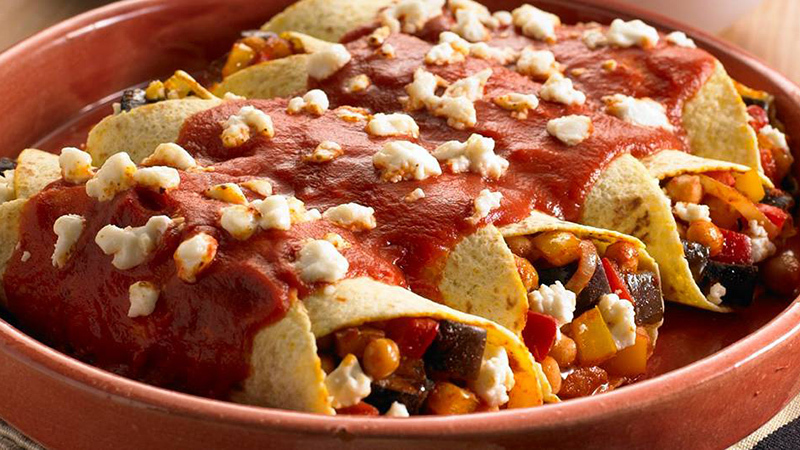 These vegetarian enchiladas are made with chunky chickpeas and aubergine with crumbly queso fresco cheese coated in tangy tomato sauce, baked and wrapped in toasty corn tortillas. Preheat the oven to 180ºC (160ºC for fan assisted ovens), gas mark 4. Lightly grease a large ovenproof dish. Heat a drizzle of oil in a large frying pan and fry the onion and aubergine over a medium heat for 3-4 minutes, until lightly browned. Stir in the peppers and chickpeas and cook for 2-3 more minutes. In a jug, mix the Enchilada Spice Mix with both sachets of the Tomato Sauce and 150ml hot water. Pour half of this mixture into the pan and simmer the veg for 3-4 minutes. Warm the Soft Corn Tortillas following the instructions on the pack. Spoon a quarter of the veg mixture down the centre of each Soft Corn Tortilla, sprinkle with cheese and roll up. Repeat with the other 3 tortillas, saving some of the cheese for the topping. Place each filled tortillas folded side down in the ovenproof dish. Pour the rest of the sauce over the top and scatter the rest of the crumbly cheese. Bake for 10 minutes until golden and bubbling. 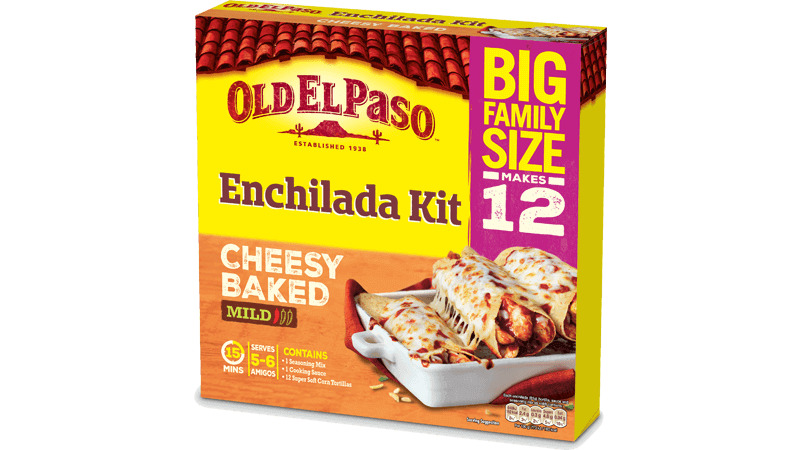 Take the hot crunchy enchiladas straight from the oven, whack them on a big plate and get everyone involved.